Severe weather or heat exposure can damage roof shingles. Heat exposure can cause the shingle to buckle or form a bubble and in some cases, become torn or cracked and you usually cannot repair them but must replace them instead. In some instances, it's only a matter of pulling the shingle up, flatting it under bricks and then re-adhering it with tar and nails. Place a ladder against the roof away from satellite dishes and suspended wires. Climb onto the roof and have someone hand you a claw hammer, pry bar, shingles, putty knife, heat gun, nails and a bucket of tar. Insert a pry bar under the damaged shingle to scrape the tar from the roof under the shingle. Pull up the nails in the bubbled shingle with a claw hammer and then peel the shingle up. It is not uncommon for damaged shingles to tear when you dislodge them from the roof. Scrape the roof where the shingle was located with a putty knife to get up any remaining tar. The space should be flat and free of any tar. Warm the warped shingle with a heat gun until it's pliable. Have someone hand-up several bricks. Set it on the roof between two bricks to flatten it out. Leave for several hours or overnight. Cover the space where the shingle came up with a tarp. Place bricks on the tarp to keep it in place. Take up the tarp and remove the flattened shingle from the bricks. Replace the flattened shingle by pouring a small amount of tar onto the bare roof and tack down with roofing nails and a hammer. 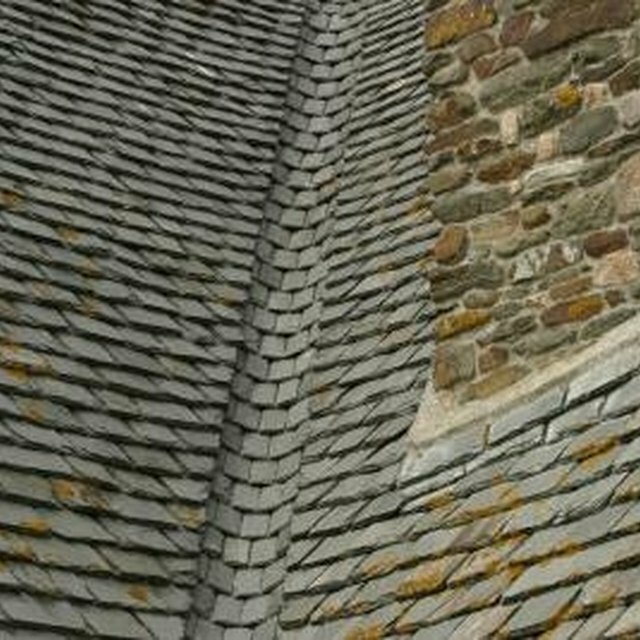 If the shingle ripped when taking it up, simply replace it with a new one.